← What’s So Great About Firefly? Snapshot: Batman: Year One is one of the most influential comic book stories of all time. The direct-to-DVD adaptation is very faithful to the source material, with excellent production values. It is well worth watching. Batman: Year One could easily be called James Gordon: Year One, for it is Lt. Gordon’s (Bryan Cranston) character that provides the overriding through story (Cranston even gets top billing). A world-weary Gordon arrives in Gotham City from his previous assignment as punishment for breaking the unwritten code of the policemen’s brotherhood: he turned in a cop on the take. What he finds in Gotham is a force that is corrupt all the way to the top. Commissioner Loeb (Jon Polito) is firmly in the pocket of mob boss Carmine Falcone (Alex Rocco), and Gordon’s new partner Detective Flass (Fred Tatasciore) is not only corrupt, but is also a violent sociopath who will do anything to intimidate crooks (or Gordon himself, for that matter). Meanwhile, Gordon’s home life is rocked when he has an affair with Detective Sarah Essen (Katee Sackhoff) while his wife Barbara (Grey DeLisle) is pregnant with their first child. And then a crazy man in a bat costume begins taking out bad guys. Bruce Wayne (Ben McKenzie) has returned from twelve years of mental and physical training to avenge the death of his parents at the hands of criminal scum. He finds it’s not so easy, and is almost killed on his first night out in a simple disguise. But a bat flying into his mansion quickly inspires him, and Batman is born. At first wary of each other, but ultimately realizing they are the only two morally true protectors of Gotham City, Gordon and Batman begin to make a dent in the corrupt police force and the mob that controls them. In a brief appearance not very instrumental to the plot, prostitute Selina Kyle (Eliza Dushku) decides to emulate the mysterious bat-man, who in her mind has some kindred fetishes, and literally becomes a Catwoman burglar. The directors made a deliberate decision to remain very faithful to the graphic novel, making it appealing to the fans who expect a lot from one of their favorite stories. The script sticks very closely to Miller’s terse original. The animation keeps the spirit of the original art, wonderfully carrying the action. It has an anime flow added to it from the Korean studio (MOI Animation) that did the production. The ugliness of the city and its inhabitants comes through in gritty detail. The city becomes a character in itself, creating claustrophobia that closes in on Gordon and Batman. The voice talent, especially Cranston as Gordon, do a wonderful job conveying the tone of the story. The only small exception is McKenzie’s Batman. I understand they wanted a younger, less confident sounding voice, but when we are so used to Kevin Conroy, it’s hard to switch. And it’s not like Conroy didn’t do a terrific younger version in Batman: Gotham Knight (2008). But as Batman gains confidence through the course of his first year, so does McKenzie’s voice gain strength. Batman: Year One is a nice complement to Batman Begins (2005), which took many of its elements from Miller’s scenario. Batman Begins focused more on Bruce Wayne’s training, while Year One focuses more on Batman’s indoctrination into the world of crime fighting. Be advised that Batman: Year One is not watered down. The sexual situations, dialog, and violence are not for children! 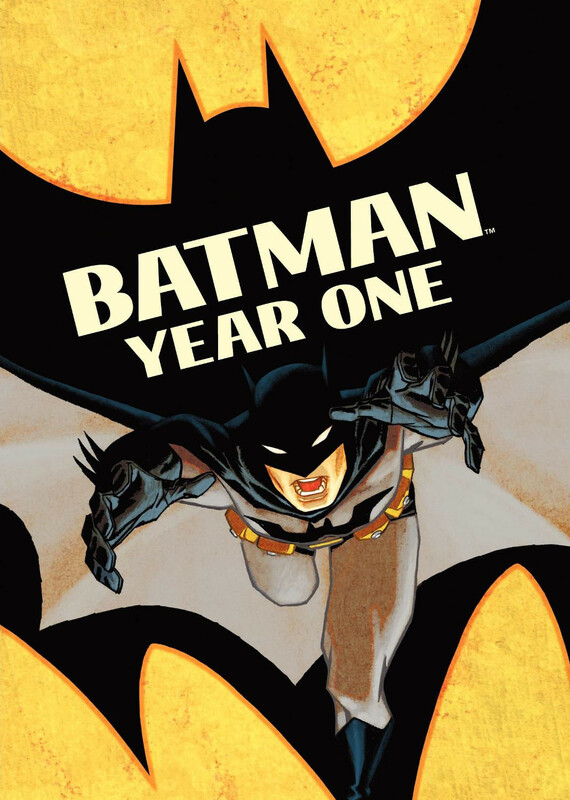 Batman: Year One is a well-done tribute to one of the greatest Batman comics of all time: the story of crime-fighting badass James Gordon and his partner, the man in the bat suit. This entry was posted in Animation, Comics, Movies and tagged animation, Batman, comics, movies. Bookmark the permalink. Thanks for the review-now you’ve got me curious to watch it.